While North was developing his mining enterprise, the leaders of Sydney society also began casting their eyes in the direction of Katoomba. The 1870s had seen the growing popularity of the areas of Springwood and Mt Wilson as locations for country retreats. The 1880s-90s saw the beginnings of an era of hotels and guest houses in Katoomba and the upper mountains. Shops, schools and a local newspaper appeared and in 1889 the town was gazetted as a municipality. Its first Council was elected in January 1890; it governed a socially divided community – at one extreme a roaring mining camp with slab and weatherboard cottages and hotels, cable ways and horse drawn tramways stretching out into the Megalong and Jamison valleys and at the other a fashionable and wealthy resort high on the hill of Katoomba Street, together they comprised about 100 buildings. The early visitors who arrived during the 1880s and 1890s were primarily from the privileged classes. They stayed in gracious comfort at stylish establishments like The Carrington, The Leura Coffee Palace (later The Ritz) or The Balmoral and sought the mysteries of nature among the cool fern walks and glens. They had money and leisure and the Blue Mountains offered a hill station retreat from the summer heat and dirt of the city, and the pressures of the political and business world of Sydney. By the turn of the century economic and social changes were occurring in the wider Australian community which began to produce a more affluent and mobile middle class. Visitors whose preference was for cheaper less palatial accommodation arrived and the patronage of the rich moved elsewhere. 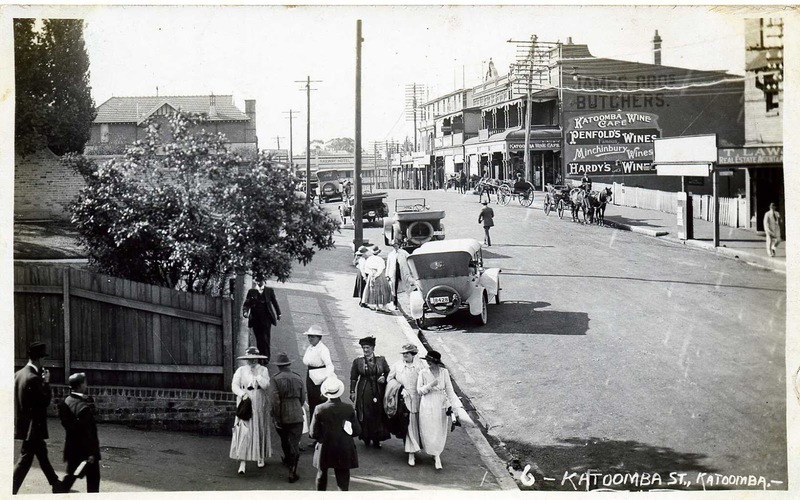 As the war clouds began to gather in Europe Katoomba was entering its boom period and in the post war optimism of the 1920s there were over sixty guesthouse operating in the town. The motor car also revolutionised tourist activity and tourist coach firms flourished in many of the upper mountain towns, some guest houses even kept their own fleet. To the holiday makers and honeymooners who flocked to the guest house during the twenties and thirties, Katoomba was the holiday capital of NSW. 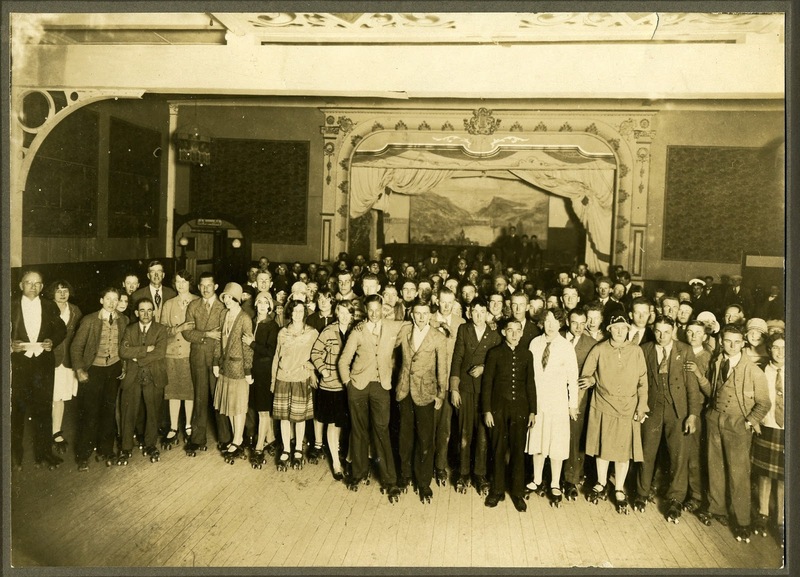 They spent the days touring the sights in their charabancs and putting roses in their cheeks in the bracing mountain air; and in the evenings danced, roller-skated and attended the latest moving pictures. Following the Second World War the Mountains became increasingly suburbanised with cheap land and long travelling hours for commuters; local tourism declined as the coast gained in popularity and cheap overseas travel become possible. The old hotels and guest houses gradually lost patronage and many fell into disrepair, some were demolished, some were converted to nursing homes hostels and a few remain. By the 1960s and 1970s day trippers arriving by car or bus replaced the long stay tourists and the supermarkets forced many of the old style shop keepers out of business, to be replaced by coffee shops, galleries and souvenir shops. 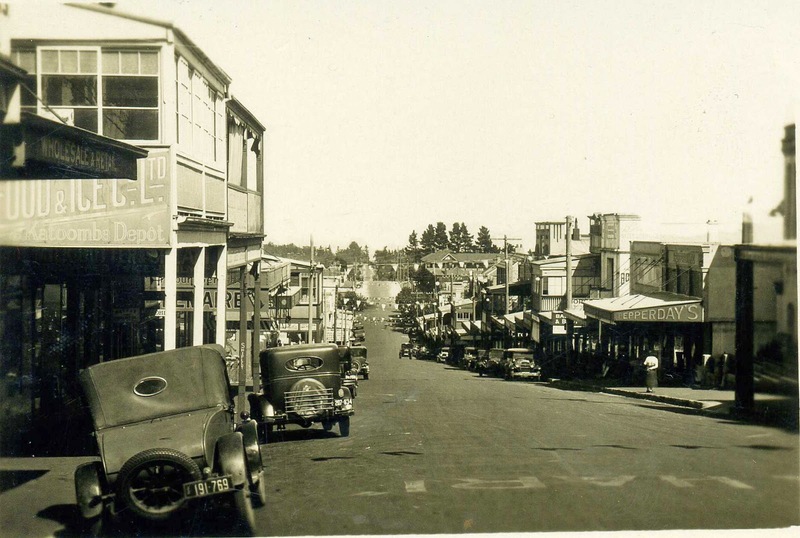 Yet despite the changes, the economic and other benefits of preserving the extensive original building fabric of Katoomba have finally been acknowledged and much of the old Katoomba Street remains as do some of its stories. 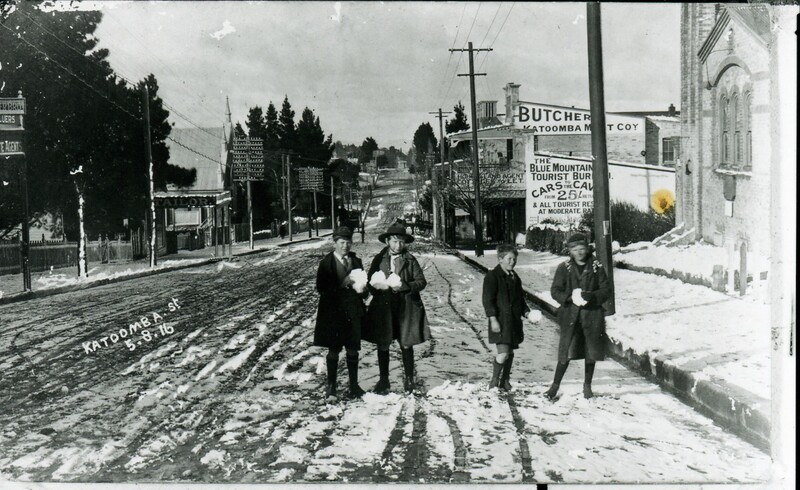 Katoomba Street was named before 1882 and is now the main street of the township. The earliest business centre however developed on Main Street, originally the Bathurst Road, in the area of The Balmoral and later The Burlington. 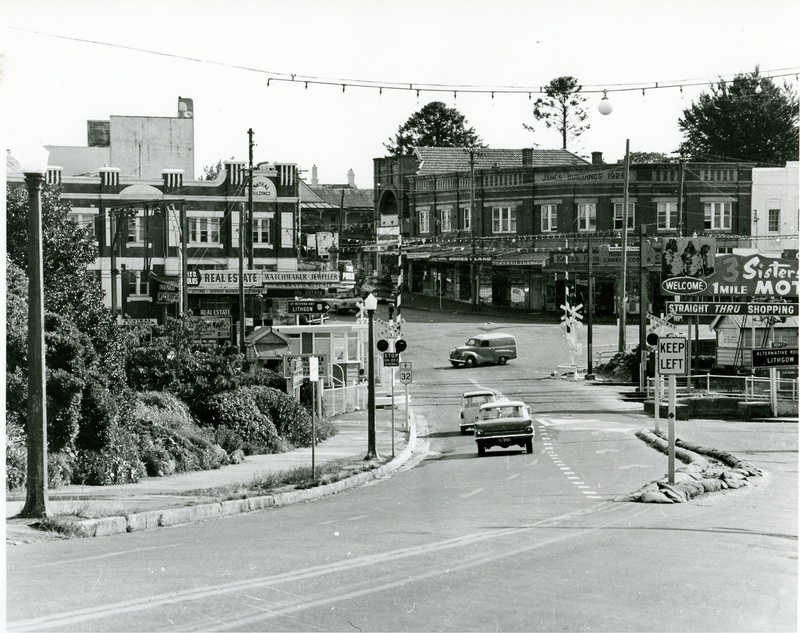 This development included the top of Park Street where the Town Hall and Council Chamber were situated, then gradually spread to the intersection at the top of Katoomba Street as the railway station became a centre of activity; then around the corner and down the hill to Waratah Street. A number of building inventories and heritage surveys have been carried out in recent years and these together with early photographs, surviving building plans and rate records, form the basis of this presentation. New information however will continue to be discovered as research continues. Following the completion of the railway line to Mt Victoria in May 1868, the area was known as The Crushers, the name of the quarry established to supply the railway with track ballast. Trains from the West also found The Crushers a convenient place to adjust their loads before the steep descent to Penrith. 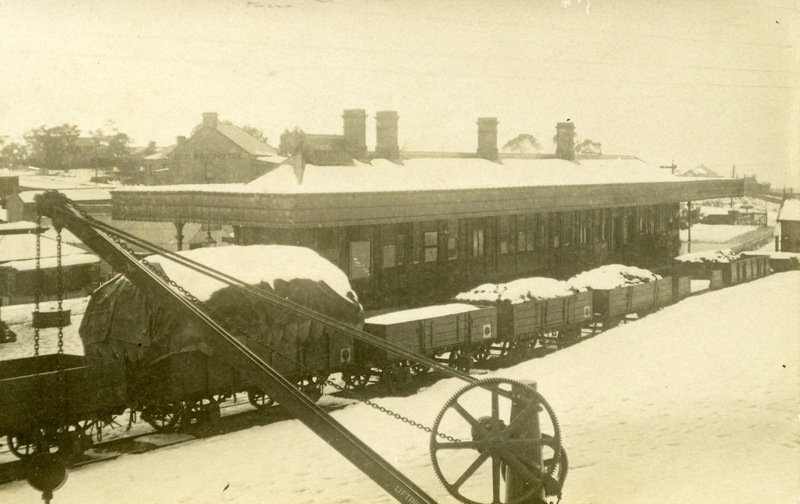 The present station building replaced an earlier timber platform and station building erected in 1881. Until motor cars become affordable in the post war period and the highway improved, most people arrived at Katoomba by train and were conveyed to guest houses by local cabbies, the most famous being the local poet, songster, raconteur and favoured driver of royalty and the aristocracy, Harry Peckman. Peckman was born in Kurrajong in 1846, and in the 1880s, with his older brother John, started a hire service of wagonettes with a fleet of 30 horses. In 1884 he rescued a tourist, a Captain Black, who had become lost in the wilderness at Echo Point for over a day thinking Katoomba was below him and trying to find a way down; he had written a last message to his family when the Peckmans found him. Harry also did the surveying for the Federal Pass walking track in 1900. In 1868 at the age of 21 he was engaged to drive the Duke of Edinburgh’s royal party to view the Wentworth Falls waterfall, thus began a long association with many heads of state, parliamentarians and international visitors, including the Governor General, Lord Carrington, Sir Frederick Darley, Chief Justice of NSW and owner of Lilianfels. The brothers established a daily coach service to Jenolan Caves in 1889 and in 1892 he married Emily Sarah McAveny from the Megalong Valley, he was 46, she just 15. A few years earlier Emily’s grandmother, had murdered her grandfather with an axe while he was drunk, because of his ‘cool treatment’ of her. Her death sentence was commuted to life and she died 10 years later in Darlinghurst goal. By 1905 the Peckman’s fortunes were in decline and Harry spent his final years as a cabbie on the rank until he was granted a government pension at the age of 83, five years before his death. Peckman’s Road was named after him around 1900. George James (1855-1938) was a prominent citizen, butcher and businessman, man of property, alderman and twice mayor of Katoomba Council (1909-1910, 1914-16). As a member of the Council Parks and Reserves Committee he was active in establishing many of the lookouts and walking tracks we have today. 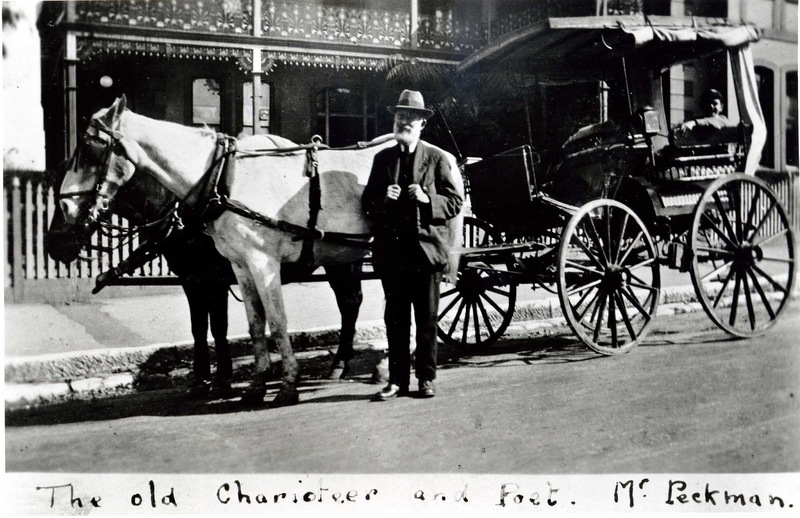 Among the many buildings he owned and erected in Katoomba, he considered the James’ Building his proudest achievement for the town, his home McClintock in Abbotsford Rd is now a B&B. See also 40-44 Katoomba St. Four of his five sons also became butchers and operated James Bros Quality Butchers at Circular Quay in the 1920s. 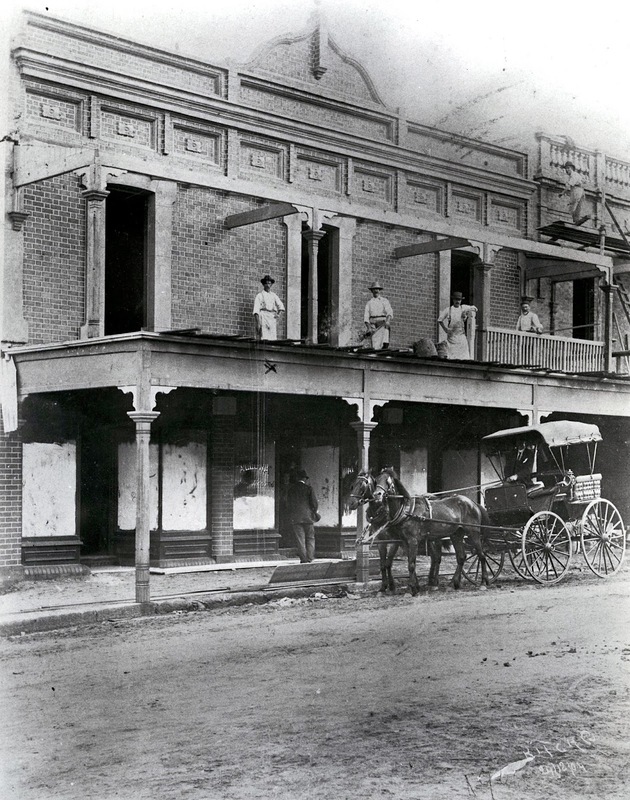 In 1882 the building of the Great Western Hotel marked the emergence of Katoomba as more than just a mining town. In 1886 it was sold by the widow of the original owner, Harry Rowell, to FC Goyder a squatter from Queensland and first mayor of Katoomba who improved its facilities, added wings to doubling its accommodation and obtained the patronage of the then Governor General Lord Carrington in whose honour it was renamed. In 1905 AL Peacock leased the hotel from Goyder and in 1905 it was advertised as ‘the largest and best known tourist hotel in the Southern Hemisphere’. He also served as an alderman on Council and in 1907 was instrumental in bringing a town water supply and the sewerage service to Katoomba. Coincidentally this also allowed the Carrington to advertise ‘a splendid service of lavatories, baths and water closets upon each floor’. By 1913 the wealthy newspaper magnate James Joynton Smith, owner of the Imperial Hotel at Mt Victoria and lessee of the Hydro Majestic at Medlow Bath, had gained control of the Carrington. He built the power station at the rear of the building with its famous tapering octagonal brick chimney and contracted to supply power to Katoomba and the upper mountains until Council built its own power station in 1925. The hotel has continued to dominate Katoomba for over a century. Carrington Inn Bar 1916 Federation free style. This building was constructed within the Carrington property by Joynton Smith around 1916, initially as the City Bank of Sydney, later the Australian Bank of Commerce 1918 and the Bank of NSW 1931 and converted to a saloon bar 1933, classified by the National Trust 1978. Also constructed on Carrington property by Joynton Smith, in front of an older boarding house dating from 1884 which Joynton Smith purchased for his wife and named Clarendon House, this was demolished around 1937. These shops are listed as a local heritage item. This was Katoomba’s fifth post office and replaced earlier temporary offices in the railway station (1880), Balmoral House (1885), Main Street (1887, 1895). In the early 1900s the local business community successfully lobbied the Government for a permanent building. 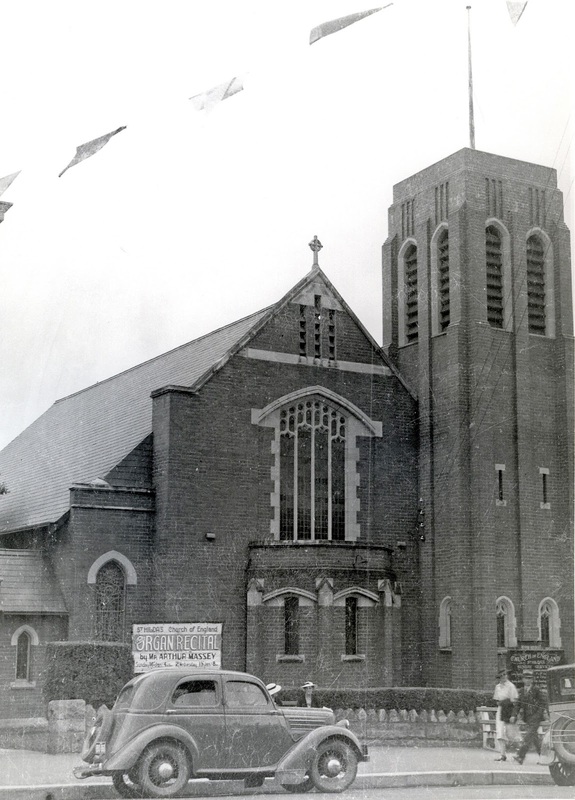 The chosen site was on vacant land which was purchased for £1100 in 1907, construction commenced the following year. In 1917 the building was altered to accommodate rest room facilities for the new female staff and in 1923 the first floor addition was made. Note the brick upper storey contrasting with the ground floor stucco. In 1996 the Post Office moved to a new building in Pioneer Place. 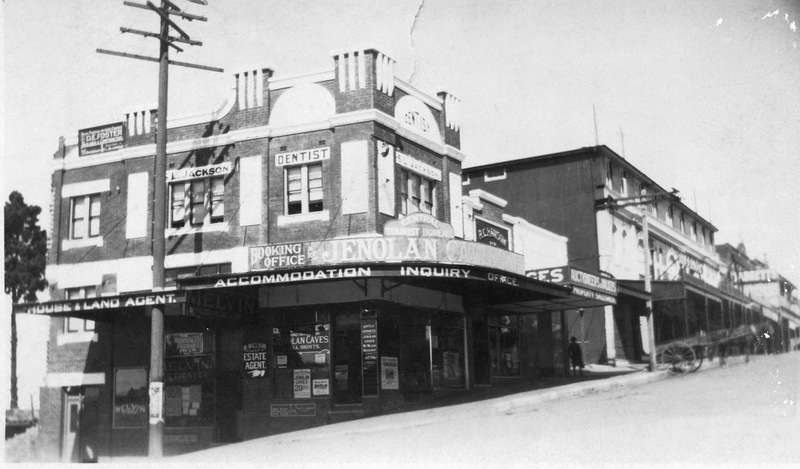 The Paragon Café building, 63-67 Katoomba St, 1916, 1925, 1934, 1936. Art Deco, Aztec Odeon (Banquet Hall) and early Modern Ocean Liner styles. Zacharias (Jack, Zac) Simos (1897-1976) emigrated from the Greek island of Kythera in 1912 with several other Kytheran boys and spent four years working in Greek cafes in Sydney and Tenterfield before establishing a business in Windsor selling ham and eggs and vegetables door to door. In 1916 after improving his English he leased a small a tea shop at 65 Katoomba Street with just four tables and a kitchen in an old weatherboard house at the rear. After he was naturalised in 1921, Jack Simos purchased the building and set about establishing a high-class refreshment room. He named it the Paragon meaning model of excellence and in 1925 engaged Henry White, architect of the State Theatre, to reconstruct the building in Art Deco style, adding the Banquet Hall in 1934. 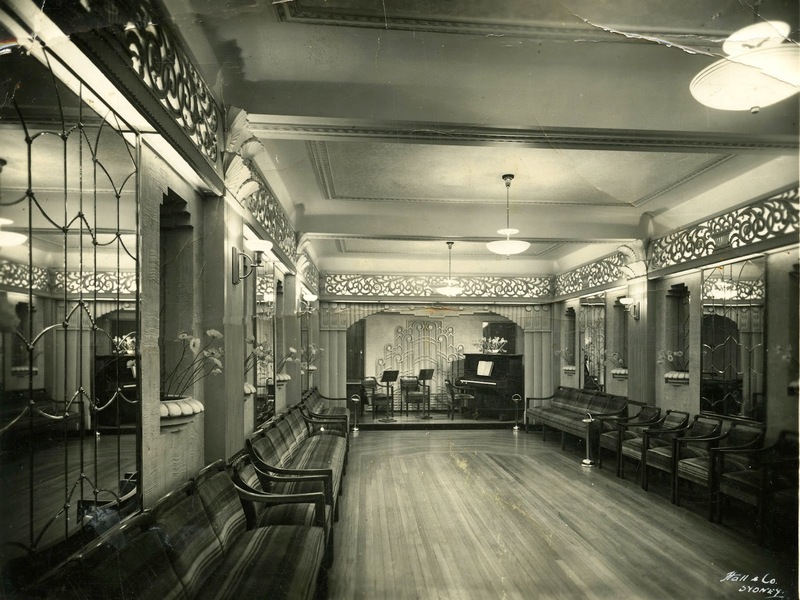 In 1936 the Blue Room was designed and built by the firm of H & E Sidgreaves who designed the original Washington H Soul pharmacies in Sydney. In 1946 the sculptor Otto Sheen produced the alabaster friezes for the front dining area of the restaurant. They depict figures from Greek mythology including Zeus, Chiron the Centaur, Apollo, the Flight of Icarus and the Judgement of Paris. The original Empire Theatre was built on this site by AH Small and A Seller in 1914 in a Federation Free Style design by prominent cinema architects Guy Crick and Bruce Furse, and opened 16 January 1915. In 1920 Seller sold the property to Katoomba Theatres, part of the Joynton Smith Management Trust, who later acquired the Kings Theatre, later the Savoy, across the road. 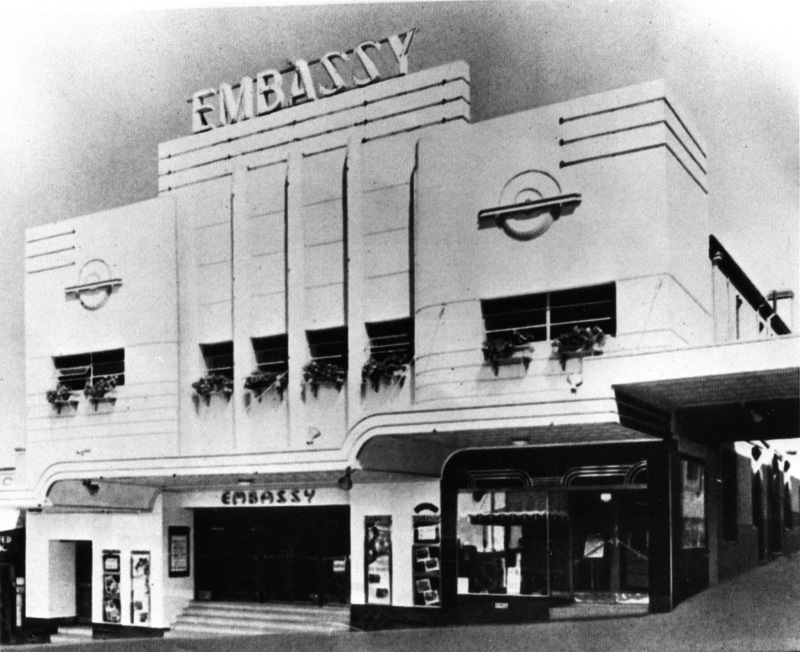 First described in contemporary accounts as ‘prettily designed’ and with ‘big crowds flocking nightly to view the pictures’, it was refurbished in 1936 with a shorter auditorium and renamed the Embassy Theatre with a seating capacity of 843. It retained the name until it was sold to G J Coles & Co for £50,000 in 1954 and remodeled by McDonald Downie & Assoc. It was more recently described as a valuable piece of cinematic history showing two decorative styles separated by 22 years. Since the 1970s the main building has been series of discount stores and the original milk bar has become a fish shop. Built by bachelor and Member for Hartley in the Legislative Assembly, James Henry Neale around 1867, Froma House is the first known dwelling of any permanence, apart from the railway gatehouse, built in the central area of Katoomba. Neale, a butcher by trade, and his brother Thomas, acquired a 400 acre portion of land running from The Crushers down to Echo Point, covering much of the area of central Katoomba, for £1 an acre in 1875, land which included several waterfalls. Around 1878 he disposed of most of the land, then known as the Katoomba Estate, to the consortium which built the Great Western Hotel, later to become The Carrington. Neale was interested in bush walking and developed many of the scenic tracks and reserves around Katoomba, all radiating from Froma. Neale Street, named before 1882, follows his original track to Katoomba Falls. In the 1870s, while on a picnic with Harry Peckman, Neale took a local Kanimbla Aboriginal woman, known as Black Bet or Princess Betsy, to Katoomba Falls and asked her what the place was called, her answer being ‘Katoom-bah’, translated then as ‘place of falling water’. However recent research has shown that this also refers to an edible fern root that was a staple Aboriginal food collected from the Megalong and Jamieson valleys. Neale died in 1890 in Wentworth Falls and was given a large Methodist funeral. In 1883 Froma was bought by Michael Metcalf (1813-1890), a merchant, customs agent and prominent Sydney Anglican, who lived there with his family until 1911. By 1914 old Froma had gone, replaced by a new kindergarten school of six rooms, close behind the new post office, which had recently been erected in rapidly developing Katoomba Street. Froma Lane was established as a right of way to connect Park and Katoomba streets and was described in the Echo of 29.08.1913 as a ‘very crooked alley that follows the tortuous plotting of the various allotments’ and contains the postmaster’s residence, now ‘Froma Court’. William Raeburn Copeland (1855-1928) was born in Rothiemay, Scotland where he trained as a stone mason arriving in Australia in1882. He worked for JB North on the mine tramway and for the railways, before commencing as a speculative builder in Katoomba until the bank crash of 1891. He built a number of stone residences in Katoomba Street and the presbytery of St Canice’s Church and claimed his son was the first white child born in Leura. In 1897 he opened the first shop in Katoomba street, a general store and timber yard which was burnt down to be replaced by the present building in 1916. In style it compliments the James’ building opposite and during the level crossing period its imposing stepped façade formed a prominent part of the town entry. The current buildings replaced a smaller group of single storey buildings sometime after 1905. Rates records show that the site was occupied by shops in 1901 and the first floor was being used as flats in 1937. This was also one of the Post Office sites. Theo Poulos real estate has been here long enough for it to now be called Poulos’ Corner. This site was formerly occupied by the Kings Theatre, sometimes referred to as the King George Theatre which was one of the first picture theatres in NSW. The Kings Theatre was constructed about 1910 and historic photos show an imposing two storey brick and stucco building in a Federation Free Style. In 1920 it was owned by Katoomba Theatres Ltd., part of the Joynton Smith management trust and operated as a live theatre, a Palais de Dance and also contained a Turkish bath. Prior to this the site was occupied by single storey timber shops with awnings which rate records show existed in 1901. According to the 1926 rate records the site was occupied by ‘casino, shops and offices’. By 1931 the Kings theatre had closed and became a shop and warehouse before the building was demolished in 1937 to make way for the Savoy complex which opened on 18th December of that year. The basement, formerly a billiard room, was used as a boys club in the early 1940s, then licensed as the Trocadero Theatre in 1946 with a seating capacity of 500 people and later as a roller skating rink. Both had been closed for some years before a fire caused extensive internal damage to the complex in June 1960. This building is significant as the only historical example in NSW of one cinema built above another, and is a good representative example of the cinema architecture of Guy Crick and Bruce Furse, important cinema specialists in NSW, whilst the shopfronts are outstanding examples of Interwar Functionalist design. In 1901 the land was owned by E Marx who was probably associated with the theatre group adjoining. By December 1904 the current building had been constructed on the site with three shops, the builder was James Ray (Jim) Anderson for the owner J Tabrett. 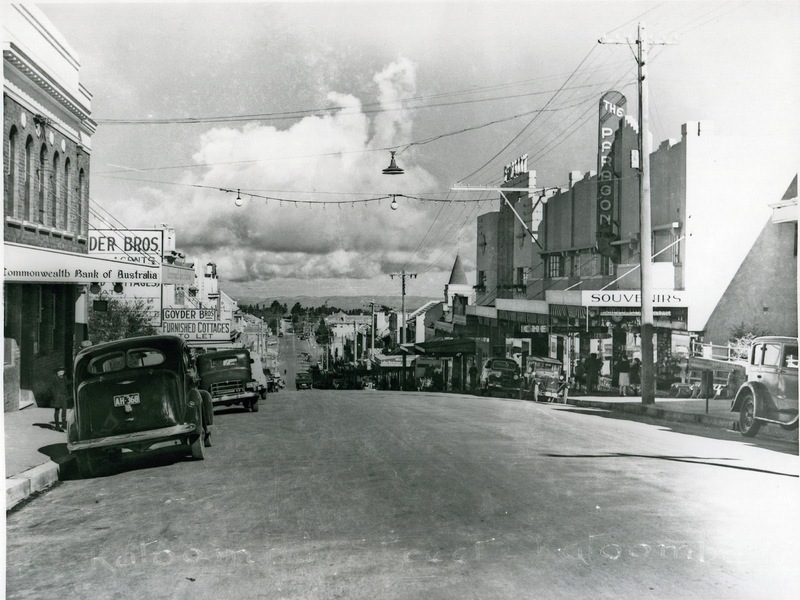 The Tabrett family was well respected in Katoomba and operated several prominent businesses including auctioneers, estate agents, Mountain Coaching and Motoring Co., tourist agents taking bookings for Jenolan Caves and a boot shop. Tabrett and Co were still operating an estate agency from this building in 1954. The Art Deco style Café Florida operated in the central shop in the early 1940s and its shop front remains intact although the original dining booths, lighting and furnishings were removed during refurbishment for a new business in 1993. James Anderson, a Scottish carpenter arrived in Katoomba with his wife Alice in 1903 and worked as a master builder for the next 40 years, his three sons Raymond, Leslie and Victor, also becoming builders. His daughters Alice and Enid were the first waitresses to be employed at the Paragon Café outside of the Simos family. James is marked with an X in the above photo. Many of the town’s early carpenters and builders were Scots, including Joseph Nimmo who arrived from Lanarkshire in 1879 aged 28 (died 1917), he operated a grocery and timber merchant business in Katoomba street on the site of Copeland’s store, owned the Railway Hotel, later Hotel Gearin in the 1890s, was Mayor of Katoomba in 1892 and a foremost Freemason. Joseph’s son Robert worked in the Katoomba post office for many years and married Alice, daughter of Katoomba’s famous butcher ‘Honest’ George James in 1918. This building was owned by George James from 1920, in the second half of the 1930s the shops included the Blue Mountains Butchery, A West bootmaker, Penfold’s Wines. The first floor façade is described as among the finest and most intact Edwardian fabric in the town centre. The western shoe store at the bottom of Katoomba Street was owned by the west family for may years. Rates records show that shops have operated on this site since 1901 and by the 1920s the three shops were owned by George James. In the 1930s the shops were owned by Penfold’s Wines, Zacharias Simos and Mr. Veripatis a fishmonger respectively. By the 1940s the third shop was known as Aroney’s Fish & Oyster Café and later as Aroney’s Café Milk Bar which was sold in the 1990s and is now called Journey. The façade is a remodeling of an older building, the walls of which are still visible at the rear. Rates records show a house occupied the site in 1901 and by the 1920 two shops owned by a Mr. Goldstein; in 1938 it was the Paris Café offering ‘meals and fountain drinks’ owned by a Mr. Comnino. Remodeling took place around 1984 for the current bank. Purpose built bank offices, in remarkably good condition, occupied by the Australian Bank of Commerce then after a merger in 1931 the Bank of NSW, renovated 1934 to a design by Peddle, Thorpe & Walker; for many years Webb’s Fashion Salon, the exclusive ladies wear shop in the town and more recently Raine & Horne real estate. This was designed by prominent 20th century architect John Burcham Clamp, a partner of Walter Burley Griffin, built by Mr. Johnson of Leura. Replaces the first Anglican church built in 1885 know as the School Church of St Hilda built through the activity of the Rev. Simons, the incumbent at Blackheath. The first clergyman was the Rev. Power; the present building was dedicated by J C Wright, Archbishop of Sydney, on 16th September 1914. The Commonwealth Savings Bank opened in Katoomba in 1913 and the present building was erected in 1926; it became the Commonwealth Bank in 1931. Significant as representative of a number of Commonwealth Banks constructed in the state during the 1920s in this style and evidence of the commercial consolidation of Katoomba during that period. 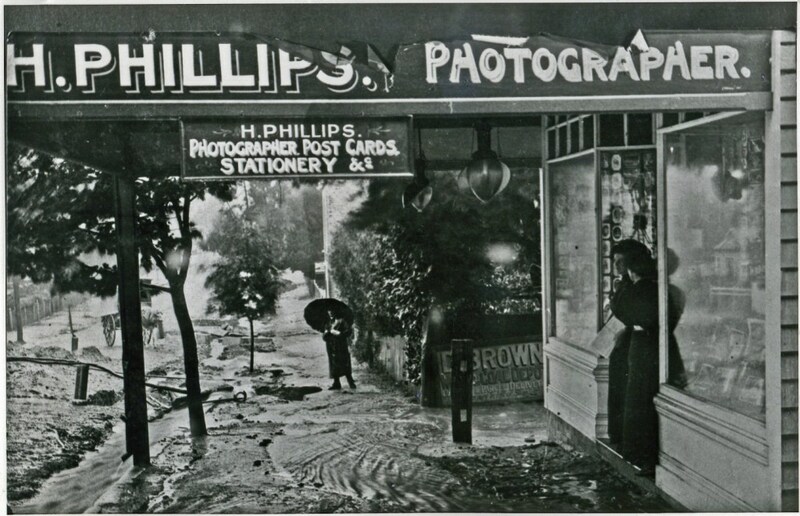 From the mid 1920s these premises housed Pepperday’s Mercery Store and Helen Hunter’s Ladies Hairdressing salon and gift store. The façade underwent later modification and during the 1990s was occupied by Crazy Prices, Go-Lo, and more recently a computer shop. Opened 23 June 1939 as a purpose designed retail outlet for the Woolworths chain. Prior to this in the 1930s the site was the premises of S Kensell Grocers and the Civic Fruit Vegetable and Confectionery Shop. It is significant as one of the few remaining examples of a chain of purpose-designed stores from the period. During the 1990s was occupied by Crazy Prices and more recently an office supplies store. 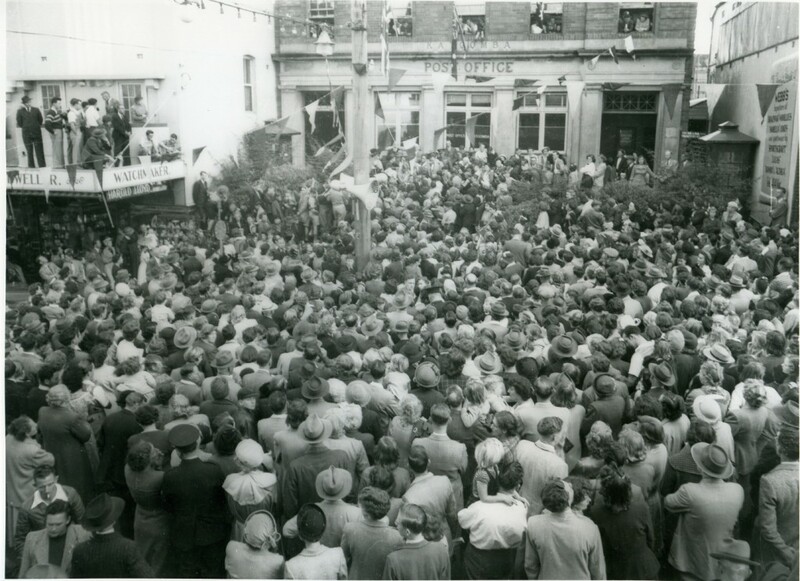 An unimproved property was purchased by the Bank of NSW in November 1938 and premises were erected in 1956-7. One of a number of purpose designed bank buildings of the Post War era in Katoomba Street which provide a positive and monumental element within the streetscape. Later is was the State Bank and more recently Mr. Pickwick’s Bookshop. Goyder Bros. were a prominent Katoomba family with interests in real estate, auctions, tours and holiday cottages. Tozzi’s building was altered in 1939 by the then owner Mr. Simos, local architect H L Blackwood. Alterations to an early building carried out in 1940 for Mr. Simos, design by local architect H L Blackwood, shopfront is post war, with cement rendered façade, and metal frame windows from 1940 modification. Katoomba Record shop in 1980s, recently a rug shop. Two storeys with exuberant parapet detailing, cement moldings and green ceramic tiles in the pedimented sections; the fine lead light shop fronts date from the 1920s. In the mid 1930s T J Andrews occupied 108-110 and the first Soper Bros. replaced a ladies hairdresser in 112-114 before Soper Chambers was built next door in the late 1930s. Now it is Higgins & Higgins Solicitors and RSPCA Op Shop. During mid 1930s Arnold’s Drapery occupied 117; McIntyre’s Katoomba Boot Palace 113 now Thompson’s Shoes. Two storey building, first floor façade of face bricks divided into three sections by wide piers rising above parapet level, stepped parapet with signage in central position, multi-paned double hung window sashes. Purpose built for Soper Bros real estate agents. From 1905 guesthouse ‘Aircourt’, 1921 ‘Springhill’, 1930 ‘Craiglee’, renamed Canberra Flats, purchased 1950 by the Rural Bank and rebuilt as present building opened December 1956 with banking chamber, offices, flats and restaurant in basement. The State Bank dated from the 1980s and Colonial State Bank the 1990s, now business stationary supplies operated by Katoomba Newsagency. Façade and sides were originally clad in ceramic tiles now painted. Three storey building, upper two storeys brick divided into three sections by wide brick piers. Pairs of large double hung windows with multi-paned sashes and concrete lintels, terracotta tile roof. During the 1930s occupied by Miss Duff dressmaker and later by a cleaner and presser 1938, the original verandah was removed and the first floor window and awning was constructed in the period 1933-38. The Duff family has been associated with the Blue Mountains for over 150 years. Robert ‘Bob’ Duff was born in Hartley 1845, his parents having arrived from Scotland five years earlier. At the age of nineteen Bob married sixteen year old Caroline Smith from Campbelltown and the couple settled in the Megalong Valley, farming 1100 acres on the Cox’s River. Between seasons Bob worked his team of bullocks, sometimes on the road for up to five months. Physically he cut an imposing figure, standing 6’3” and weighing 17 stone. Bob Duff died in March 1893, killed while breaking in a colt; he was forty eight years old and left a family of sixteen children. His wife Caroline eventually moved her family to Blackheath where she died in 1942 at the age of ninety seven. Three storey building with terracotta tiles roof contained by parapet ends. Intact shop fronts, upper storeys finished with cement render, masonry portions of bay windows finished with rough cast; timber framed double hung windows. First floor verandas were originally open with balustrading and column supports. Deep window canopy with colour blended terracotta shingles. The original 1926 house sold to Dr. and Mrs. Alcorn in 1929, by 1937 site occupied by shops and offices, became known as Ayr Lodge by 1943. This was originally Katoomba Methodist Church, the oldest church in Katoomba, foundation stone 8th September 1888, opened 17 November 1888, extensions 27 January 1907. Brick building embellished by cement rendered copings, moldings and spires arranged along the western parapet, terracotta inset panel high on main façade. In the second half of the 1930s the building was occupied by W Smith bootmaker now Peter Sudich Art Supplies & Framing (155) and Johnson & Sharp bakers (153), The Buttery. Cement rendered building with pointed stone openings, stone trimming around some openings, rusticated stone at corners and at buttresses. Squat tower with shallow hipped roof at south-western corner. Terracotta roof tiles. Two storey building with large hipped roof covered in terracotta tiles. Two storey verandah on western side with timber posts and timber shingles at first floor level which also features a cantilevered balcony. Cement rendered walls elsewhere. In the winter of 1908 Harry Phillips, an unemployed printing machinist, suffering from work injuries to both hands which cost him his job, arrived in Katoomba to recuperate. After three weeks camping out with his wife Isobel and their only child Isobel, the landscape had made such an impression that he decided to settle in the area permanently and established a small confectionery and photographic business at 159 Katoomba Street and by 1912 had moved to 179 Katoomba Street. As business expanded he combined his talent for photography with his skill as a printer, producing the Blue Mountains view books for which he has become best known. Harry Phillips brought a passionate intensity to the presentation and promotion of the Mountains that had never been seen before and would go to any length for a picture often waiting hours for the right conditions. His books were sent to the trenches on the Great War and his photos hung in Parliament House. A sober and religiously minded man of slight, wiry figure and always formally attired, his friends would joke when there was mist about, that, ‘Harry’s happy’. Harry and Isobel were both born in Ballarat into families of 11 children. Note classically derived details of later Interwar first floor addition: panels, plaques, Greek Key band. Gemglow Jewelers (157), Serene’s Café (159), Elephant Bean Café. All images from the Local Studies collection at Springwood Library. § The Prince of Whips, the life and works of the Blue Mountains pioneer Harry Peckman, John Low & Jim Smith, 1993. Oh John. What a lot of work you have done here. I have many happy memories of Katoomba and it was a very popular spot with at least three generations of my family – my mother and her mother and aunt. I can't read all of this now but I will be coming back to read it in detail. Thanks so much!